My first visit to Taos was during a road trip around the Old West, a world away from my home in bustling London. On my final day, I drove alone to the Río Grande Gorge Bridge, walked out to the very center, gazed into the river far below, and vowed out loud that I would return to Taos one day. “One day” turned out to be a couple of months later, and within a few years I was living here. What elicited my romantic declaration? Maybe I’m just part of a lineage of people who came, saw, and stayed, from the earliest Pueblo ancestors to the founders of the Taos arts colony. After all, I’d just spent a week in a writing workshop with New Mexico author Natalie Goldberg at the Mabel Dodge Luhan House B&B, and Luhan’s reputation for luring people (Lawrence, Cather, O’Keeffe, Jung) to Taos is legendary. 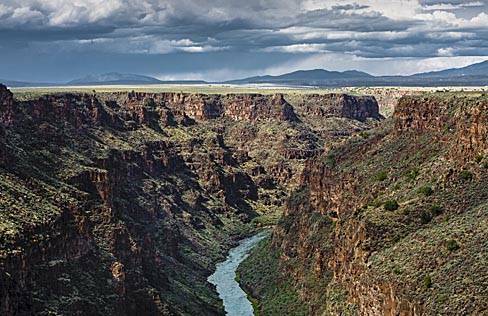 I remain mesmerized by the landscape, the Sangre de Cristo mountains cupping the valley that stretches to an infinite horizon, broken only by the dramatic vein of the Río Grande Gorge cutting through the mesa west of Taos. The flamboyant sunsets seem designed to entice artists and lovers, and creative energy pulses through this tiny town with a big heart. Everyone seems to be an artist, a writer, a musician, a creator of something, regardless of their day job. I was drawn, too, by the warm welcome of the people, whether the more cosmopolitan crowd—the New Yorkers and Los Angelenos who pulled up stakes to explore a life intimately connected to wilderness—or those whose families had lived here for centuries or more. The combination of cultural traditions keeps Taos constantly evolving, and informs everything from arts to food. Ah, yes—the food. An impressive choice of restaurants ranges from mom-and-pop cantinas to creative fine dining. Visit the Río Grande Gorge Bridge in the morning or late afternoon, when dramatic shadows reveal the gorge’s staggering dimensions and beauty. Park at the West Rim rest area (northwest of Taos on U.S. 64) and walk onto the span for vistas of the gorge and the Río Grande, 650 feet below. A nine-mile (one-way) trail from the rest area along the West Rim offers a scenic hike, or go a short way for great shots of the bridge itself—recognized in 1996 as the most beautiful long-span steel bridge in the nation by the American Institute of Steel Construction, and often featured in movies. —T.C. The Taos Center for the Arts auditorium boasts New Mexico’s only full proscenium stage north of Santa Fe, guaranteeing its popularity as a venue for local and touring concerts, dance (like Denver’s Cleo Parker Robinson Dance Ensemble, left), and drama. The venue also screens movies, and showcases local talent in its art galleries. Popular picks include the Taos School of Music Festival, Music from Angel Fire chamber-music, and the Metropolitan Opera, live from New York. (505-758-2052; tcataos.org) —T.C. Many Taoseños grew up playing pool and dancing at Old Martínez Hall. Now the 230-year-old adobe has been given a major facelift by current owner Martina Gebhardt, and a new lease on life as Old Martina’s Hall restaurant and dance hall. The massive viga ceiling remains as impressive as ever, but sleek modern features add a 21st-century touch to the restaurant in the historic Ranchos Plaza, opposite the oft-painted San Francisco de Asís church. Breakfast, lunch, and dinner combine New Mexican and European flavors (like chocolate croissants made by the French pastry chef), and you can enjoy a glass of wine or beer at the long marble bar. (575-758-3003; oldmartinashall.com) —T.C. Local and organic food is at the top of Taos’s menu. At Dragonfly Cafe and Bakery (above left), Karen Todd serves eclectic world dishes in a century-old adobe; the patio is a charmer during the summer. “I’m blessed that farmers come at the beginning of the year and ask what I’d like to have grown,” says Todd (575-737-5859; dragonflytaos.com). The Love Apple’s romantic dining room is in a cozy former chapel (above center). The organic, seasonal menu might offer chicken confit tacos with cabbage slaw, toasted pepitas, and green-chile crème fraîche (575-751-0050; theloveapple.net). Taos Farmers’ Market (above right) is a community celebration on Saturday mornings from May to October, with locals comparing recipes between tastes of goat cheese, breads, and honeys (taosfarmersmarket.org). Family-owned Cid’s Health Food Market has tempted taste buds with organic and gourmet foods for 26 years, and has a growing selection of takeout food alongside the grocery shelves. Pick up hot tamales for a picnic on the patio (575-758-1148; cidsfoodmarket.com). —T.C. The Earthships on the mesa west of Taos were pioneered by architect Mike Reynolds, the subject of the documentary Garbage Warrior. These striking, off-the-grid homes are built with recycled materials, including tires, bottles, and cans, and are mainly solar powered. Learn more at the Earthship Biotecture World Headquarters and Visitor Center, take a weekend seminar on how to build one, or rent one by the night, fully equipped with WiFi and TV. Visitor Lydia Fazio Theys, from Connecticut, told me her Earthship stay made her feel “closer to the earth. At night, with the moonlight shining through the bedroom skylight, we just lay there, enjoying a kind of peace you could never find in any hotel.” (575-751-0462; earthship.com) —T.C. Seven miles north of town, en route to Taos Ski Valley, Arroyo Seco is a sweet spot to pause—especially with a Cherry Ristra or Piñon Caramel ice cream by the creek outside the Taos Cow Scoop Shop, Cafe, and Deli (above left). The rBGH-free ice cream is flavored with New Mexico ingredients, from lavender to pistachios (575-776-5640; taoscow.com). Rustic Abe’s Cantina y Cocina is a true local hangout with delicious breakfast burritos, with or without a beer from the bar (575-776-8516). At ClaireWorks (above), textured, graceful, yet sturdy jewelry by Claire Haye includes the silver Loving Heart pin and Strength ring. The shop’s ceramic murals are inspired by tiles Haye saw on a trip to Spain. “It looks beautiful in New Mexico,” says Haye. “We could tile everything, as far as I’m concerned” (575-776-5175; claireworks.com). In summer, outside Scott Carlson’s Gallery, you might spy him throwing colorfully glazed pots. Pocket-friendly prices start at $10, and when Carlson’s not there, leave payment in the money box—a telling display of small-town trust-thy-neighbor (575-770-7695). Directions to Arroyo Seco: visitseco.com. —T.C. Art workshops abound in Taos. “You want to sing country music, you go to Nashville. You want to make pottery, you come to the Southwest,” says Logan Wannamaker of Taos Clay (below right), who offers half-day pottery workshops. Wannamaker fires my vase in his outside kiln, then we cool it in a metal trash can filled with newspapers. Voilà—a shimmering green vessel is mine to take home (575-770-4334; taosclay.com). Geraint Smith Photography safaris focus on everything from grand landscapes (Taos Gorge, Taos Mountain) to detailed architectural elements of old adobes and barns. “I interact with the environment a lot. What I’m offering is learning how to see,” says Smith. (505-501-4880; geraintsmith.com). —W.S. Wild Earth Llama Adventures will take you on a four-to-10-mile lunch hike into the wilderness of the Sangre de Cristo Mountains at elevations above 8,000 feet (your llama carries lunch and gear); an eco-guide points out flora and fauna (575-586-2159; llamaadventures.com). The Taos Fly Shop (575-751-1312; taosflyshop) teaches fly-fishing in secluded, private stretches of the Brazos, Conejos, and Chama rivers. Balloon flights over the Río Grande Gorge are the specialty at Pueblo Balloon Company (575-751-9877; puebloballoon.com). White-water rafting, kayaking in the scenic Río Chama, and mountain biking on ambling desert terrain or hard-core Alpine downhill are arranged at New Mexico River Adventures (800-983-7756; newmexicoriveradventures.com), while Far Flung Adventures offers river trips from a few hours to three days for all skill levels, ranging from floats on the Río Chama to the thrilling Class IV white-water rapids of the Taos Box (800-359-2627; farflung.com). —W.S. Twirl Toystore and Playspace is a kid’s dream come true, in a warren of rooms where artist Agnes Martin once lived. Spot the wishing well, and explore the free courtyard playspace, which feels like a magical secret garden with a huge climbing structure, crazy mirrors, tree house, slide, and sandbox. The mom-owned toy shop focuses on educational toys and games; the free activities include ballet and music-making for preschoolers, and crafty sessions for kids of all ages. Check the weekly schedule online, and just turn up. (575-751-1402; twirlhouse.com) —T.C. For winter athletes, nothing beats the world-class Taos Ski Valley alpine resort, which boasts adrenalin-pumping vertical runs down the Sangre de Cristo Mountains northeast of town. The resort has a base elevation of 9,207 feet and lifts that take you to 11,819 feet. It offers 113 trails, 50 percent of them Expert, and the rest evenly divided between Intermediate and Easy. It offers spiky summits, distant chutes, and undulating cruisers on immaculate, fluffy mountain powder. The ski slopes are usually open Thanksgiving Day until the first Sunday in April. From February 28 through March 2, the mountain will host the 2013 Salomon Extreme Freeride Championships, a prestigious ski and snowboard competition with a $15,000 purse. On March 9, sample beers from throughout the Southwest at the Spring Beer Festival (575-776-2291; skitaos.org). For a boutiquey experience of the Ski Valley, consider the Hotel St. Bernard, named after the patron saint of skiers, located right next to the main chairlift at Taos Ski Valley. Have a green-chile cheeseburger on the deck, then retire to one of the Antoine Predock–designed condos. The hotel’s cuisine ranges from grass-fed organic filet mignon with foie gras to yellow-curry Asian vegetable soup. The all-inclusive Ski Week package bundles ski lessons, lift tickets, and meals (575-776-2251; stbernardtaos.com). —W.S. Descendants of the area’s earliest residents still live at Taos Pueblo, a National Historic Landmark and a UNESCO World Heritage Site. Get a taste of what life on this continent was like before contact with Europeans while viewing the Pueblo’s multistory adobe dwellings, built at the foot of Taos Mountain between AD 1000 and 1450, and said to be the country’s oldest continually inhabited community. The traditional buildings have no electricity, and drinking water comes from the river. I recommend taking the tour with a Pueblo guide for more intimate insight into this sovereign nation’s history and culture. It’s also worth buying a photo permit; photo ops include the beautiful 1850 San Geronimo chapel. The most precious souvenirs I’ve taken home from the Pueblo are not just the crafts available for sale, but my time spent talking with the artists about their work and life, including moving memories of that triumphant moment in 1970 when 48,000 acres (including sacred Blue Lake) were returned to the Pueblo, after their long struggle to reclaim their ancestral lands. You’ll see traditional dances on ceremonial days, and at July’s Taos Pow Wow, when the land reverberates with the drumbeats and songs of tribes from the rest of North America. Check for occasional closures, including the months of February and March 2013. (575-758-1028; taospueblo.com) —T.C. Inger Jirby is a doyenne of Ledoux Street, the town’s historic Artists’ Row. “I have always been a colorist, but Taos is a very inspiring place,” says the Swedish-born painter. “The landscape is right on your doorstep.” Inger Jirby’s Gallery carries other artists’ work too, and the garden is studded with whimsical giant poppies and animal and wind sculptures. Jirby decorates the guesthouses she rents out with her own art and in her trademark splashy, colorful style (575-758-7333; jirby.com). At the top of Ledoux, 203 Fine Art shows the Taos Moderns Louis Ribak and Beatrice Mandelman, and contemporary artists like Tom Dixon, renowned for his knockout abstracts. Taos Moderns’ works are still reasonably priced compared to those by Taos Founders, and are popular with fashionable younger couples decorating in 1950s style. (575-751–1262; 203fineart.com). Copper Moon Gallery, on Kit Carson Road, is home to an eclectic array of local artists, potters, and jewelers, including Taos Pueblo’s Jacqueline Gala, with her signature silver gate pendant. “Visitors are overwhelmed by the incredible talent in Taos,” says owner Diana Miller (575-758-8833; coppermoongallerytaos.com). —T.C. Take a three-hour felting workshop at Taos Fiber Arts, decorating a length of silk, and come away with a one-of-a-kind scarf. “It’s not hoity-toity art,” says free-spirited Ashley Cloutman (575-758-9826; taosfiberarts.net). For the ultimate woolly-bully fiber-arts fête, get tangled up in the Taos Wool Festival, October 5–6. Pet the alpacas, goats, angora rabbits, and sheep in the Fiber Critters Showcase; shop for shawls, sweaters, and the warmest socks you’ll ever own from juried vendors in the wool market; see demonstrations of shearing and spinning; and groove on the mellow ambience in Kit Carson Park as country bands perform and folks bid in the silent fiber-arts auction (taoswoolfestival.org). —W.S. The E.L. Blumenschein Home & Museum, in a 1797 traditional adobe structure, still has furniture and easels on display from when Blumenschein lived here in the early 1900s (575-758-0505; taoshistoricmuseums.org), while La Hacienda de los Martinez (575-758-1000), a Spanish Colonial house that was a trade center in the 1800s, offers a glimpse into frontier existence in the early 19th century. The Taos Art Museum & Fechin House (575-758-2690; taosartmuseum.org) is where Nicolai Fechin lived, a Russian-born artist who became a famous member of the Taos art scene when he moved here in 1927. Today the museum includes his paintings, plus artworks by members of the Taos Society of Artists and the Taos Moderns. —W.S. At The Harwood Museum of Art you’ll find many prized historic pieces, as well as selections from John Marin and Marsden Hartley and contemporary work from the Taos Moderns. The permanent collection includes over 3,000 works, including those of Agnes Martin as well as contemporaries like Lee Mullican and Larry Bell. It’s a gem of a cultural center, with films, lectures, chamber music, and even weekly yoga classes. (575-758-9826; harwoodmuseum.org). —W.S. At World Cup Café, rub shoulders (literally, in this snug space) with Taos writers and artists fueling the muse with an orange-zest Mocha Borgia—or people-watch from an outside bench on the Taos Plaza corner (575-737-5299). The counter at Michael’s Kitchen Cafe and Bakery is my favorite spot to hang out for yet another refill; cinnamon rolls in this friendly Taos institution feed two (575-758-4178; michaelskitchen.com). In Taos Ski Valley, sip a cup with a kick at Black Diamond Espresso’s cabin kiosks. Their Mocha Maya melds espresso and Mexican chocolate with a chile spice mix. Open on the upper deck for ski season (and some days in June and July), and at the Phoenix No. 4 chairlift location (575-770-3122). —T.C. Society heiress Millicent Rogers made fashion history in 1948 with a photo in Harper’s Bazaar of her wearing a white Valentino blouse, black skirt, and multiple silver-pawn cuff bracelets—a photo you’ll find at the Millicent Rogers Museum, along with many of those very bracelets. “That photo made me want to do the book,” says Cherie Burns, author of a biography of Rogers, Searching for Beauty. “She really was ahead of her time.” The museum includes the Indian rugs that Rogers collected, silver and turquoise jewelry that she bought and designed herself, her sketches, concho belts, and a high-end gift shop said to do more business than many other retail stores in Taos. (575-758-2462; millicentrogers.org) —W.S. Wabi-Sabi is a Japanese aesthetic that appreciates imperfect or ordinary beauty. It’s also a cool Taos boutique for home goods, gifts, and teas. “Taos is really Wabi-Sabi!” says owner Cassandra Bates. “Think about the things you love about Taos: It can be a latilla fence leaning in the wind with the sunlight hitting it just right. Someone might see it as disheveled, broken down. Another person sees it as beautiful and perfect, just the way it is” (575-758-7801; wabisabigifts.net). Dress to impress at Substance of Taos, with timelessly sophisticated designer pieces in fine fabrics: silk, cashmere, linen, and organic cotton. “It’s got to feel good, smell good, and hang good,” says owner Molly Massen, who carries labels including James Perse and Chan Luu (575-751-0992; substanceoftaos.com). Curl up with cats Mabel and Tony in a comfy chair at Moby Dickens Bookshop while browsing Southwestern titles, gifts, and shelves of books signed by local authors (575-758-3050; mobydickens.com). You can smell the Wild West leather the moment you walk in to Letherwerks (575-758-2778; letherwerks.com) to buy belts, bags, hats, and vests, or watch owner Kristian Moore working on custom-made pieces. Letherworks and Moby Dickens are in the John Dunn House Shops, a pretty pedestrian area lined with specialty stores (johndunnshops.com). —T.C. You get a two-for-one at Taos Inn, which encompasses both Doc Martin’s Restaurant and the Adobe Bar. Enjoy a classic New Mexico entrée and well-recommended wine pairing for dinner at Doc Martin’s, then mosey over to the Adobe Bar for a Cowboy Buddha margarita and local live music (no cover) of all stripes, from Native folk to alt-country. Taoseños have been kicking back here since 1936, and show no signs of losing interest. (575-758-2233; taosinn.com) —W.S. Serving up American-World cuisine, some of it even gluten-free, in a bright contemporary setting, Graham’s Grille by Lesley B. Fay offers such muy delicioso specialties as Vanilla Orange French Toast (left) and Pork Carnitas Migas at Sunday brunch. Says Fay, who perfected her gastronomical game in Sonoma, “We try to keep most of our entrées under $21. It’s gourmet food and it feels very hip.” (575-751-1350; grahamstaos.com). —W.S. Offering 11 luxury guest rooms, the Hacienda del Sol B&B (pictured above and on the cover) was home to arts patroness/writer Mabel Dodge Luhan back in the Twenties. The Cowgirl, for example, is an airy second-floor room with huge windows opening to cottonwood and willow trees and an awesome view of Taos Mountain. Inside? Painted wood furniture in salmons and blues, plantation shutters, colorful Mexican-tiled bathroom, steam shower, kiva gas fireplace, and skylights. This inn is conveniently tucked away on Mabel Dodge Lane, adjoining Taos Pueblo land. Breakfast takes place at communal tables overlooking the garden, with spinach frittatas and omelets among the daily specials served on brightly colored tableware. Visit at the right time, and the inn’s lilac trees might be in bloom, or the 600 daffodils or 2,000 tulips. (575-758-0287; taoshaciendadelsol.com) —W.S. Taos is now home to 20 or more artists working in glass. “Glass is translucent, it has color, it reflects the light like no other substance; it has so much intrigue!” says Delinda VanneBrightyn, president of Taos Institute for Glass Arts (TIGA). A half-dozen Taos galleries now feature glass art, including David Anthony Fine Art, with its colorful and functional glass bowls (575-613-6484; tiganm.org). —W.S. Microbreweries are all the rage here. Taos Mesa Brewing Company (575-758-1900; taosmesabrewing.com) launched last September in an old warehouse west of town, with handcrafted beers like Lunch Pale Ale and Fall Down Brown, and bratwurst and burgers, accompanied by local jam bands. Situated just off the Taos Plaza in a nearly 100-year-old adobe house, the cozy Eske’s Brew Pub and Restaurant (575-758-1517; eskesbrewpub.com), a longtime Taos fixture, serves up Beer-Battered Club Sandwiches with such special offerings as pumpkin, peach, and chile beers. And at Taos Ale House there are home-brewed pints and guest taps like English Stout and Belgian tripel, served with pizza (575-758-5522; taosalehouse.com). —W.S. March 7–10: Taos Shortz Film Fest. November 28–January 1: Yuletide in Taos. From Thanksgiving through New Year’s Day, this fest includes the lighting of farolitos around Taos Plaza, a beer festival at Taos Ski Valley, a torchlight parade at Taos Ski Valley, and other holiday events. taoschamber.com —W.S.